As the advertising industry has grown and evolved, so too has our relationship with advertising agencies. These companies, from SEMs to the largest traditional agencies, play a critical role in the continued success of Google, our advertisers and our industry — so we spend a lot of time talking to agencies about how we can make it easier for them to work with us and our advertisers. We’ve had a lot of great feedback from agencies and today we’re announcing changes designed to offer them better training and more rigorous certification in AdWords proficiency, and to lower costs for those who help advertisers get the most out of AdWords. We’re also making it easier for advertisers to find certified agency partners to work with them on digital advertising. Here’s an overview of what’s changing today. A redesigned Certified Partner badge, which includes a “Click to Verify” element so advertisers can view the partner’s profile page for additional information. For more information on the AdWords Certification Program or to create an account, visit the Google Certification program site and help center. Google Certified Partners can opt in to Google Partner Search, an online, searchable directory that helps advertisers identify Certified Partners that meet their criteria. Small and medium-sized advertisers who haven’t previously used an agency have told us that evaluating potential partners can be a daunting task, so we think Google Partner Search will be especially valuable for them. To show up in advertiser searches through Google Partner Search, agencies must opt in and fill in details about their core attributes and capabilities. Searches can be filtered by location, agency experience within a particular budget range, the types of services provided and the industry verticals an agency serves. Advertisers can then evaluate the list of Certified Partners that meet their criteria and contact the partners who seem best suited to their needs. To learn more about Google Partner Search, visit the Help center. Today, we’re announcing preferred AdWords API pricing. This gives qualified Google AdWords Certified Partners who manage client AdWords accounts free use of the AdWords API based on managed client spend. To apply, agencies must have an active agency profile page and remain compliant with the AdWords API terms and conditions. We’ll evaluate applications for preferred AdWords API pricing based on the criteria listed here. We’re looking forward to receiving feedback on all of these initiatives and to continuing to improve our partnership with agencies. To provide you with more case studies more often, we're pleased to bring you a new blog series, "Coffee break with clients." Each post will highlight a brief chat we've had with a client on how he or she has used a Google solution to solve a marketing challenge or meet an advertising goal, focusing on specific steps that you can replicate for your own clients. Q: What were the goals of your experiment? A: Our goal was to get quantitative data showing whether there was value to bidding on our branded keywords. On one hand, we felt that by bidding on our brand terms, we were paying for keywords that may have been at the top of the organic search result. On the flip side, if we were missing out on conversions/sales, it may be valuable to pay for those terms. Basically, we wanted to take the visceral piece out of the conversation and replace it with facts. Q: How did you set up and execute the experiment? A: We worked closely with Google to conduct the experiment in a statistically meaningful manner, from concept, execution, and analysis. We set up an A/B test in Google AdWords by creating two campaigns, each targeting half of our focus demographic marketing areas (DMAs), distributed so each campaign targeted a similar audience size. The first campaign included brand terms while the second campaign did not. The test ran for 30 days. Q: How did the Google solution perform? Q: What actions, if any, did you take as a result of this campaign? A: We immediately tripled our ad spend with Google and are still making impressive double digit ROAS. Q: If you did not use this Google solution, how would things have been different? A: We would have continued spending precious time debating personal theories on the value of branded keywords to paid search that had no data behind them. We are now taking search much more seriously and are incorporating it as a significant factor in our growth strategy. For more information on geographic targeting options, visit the AdWords Help Center. Here on the Google Agency Team, we commonly get requests to share case studies, both as a way for you, our agency partners, to feel confident in the effectiveness of a product or strategy, but also for you to learn best practices and be inspired by best in class examples. As president of the Art Directors Club, an organization for creatives and designers in integrated media and the first international creative collective of its kind, it’s my job to continually look for new opportunities to translate the club’s mission -- to connect, provoke, and elevate advertising initiatives into action. That’s why I’m honored, and totally psyched, that ADC is part of an amazing new initiative launching today, YouTube Show & Tell. Each quarter, ADC will curate a lively and interesting new body of work in four categories -- brand channel, home page, viral video and interactive. We will promote the entry process, assemble creative experts to review campaigns that have run on YouTube, and elevate the best work to the forefront. All advertising and marketing work appearing on YouTube is eligible. Lady Gaga isn't the only one creating a ruckus about "Telephones" these days. Google and Compete are excited to share their latest research findings on cell phone and smart phone shoppers. With so many choices, how do consumers make wireless telephone purchase decisions? How do they shop online, and how can marketers effectively command their attention? For answers to these questions and more, join Compete's Mobile & Wireless expert, Danielle Nohe, and Google Tech Industry Account Planners, Megan Runser and Marl Gatchalian, on Tuesday, April 20th, at 2pm EST/11am PST, for ThinkTech: Wireless 2.0 Shopper. To date in Ad Planner, advertisers have used site categories, which describe the content of websites, as a proxy for audience interests. For example, to plan an ad campaign for a pet product, advertisers would look for sites with content about pets for their media plan. While this may be an appropriate proxy, it also may overlook some great sites, since when people are interested in a topic, they don’t only visit sites about that topic. Audience interests in Ad Planner helps advertisers find a wider range of sites for their media plan without compromising their ability to reach the right audience. 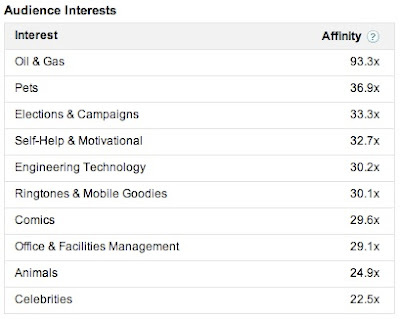 With the “Search by audience” tab in Ad Planner, selecting the “Pets” interest will reveal a list of sites that have a high affinity with audiences interested in pets. While some of the sites will be about pets, many additional sites will be about other topics. Take the screenshot below, which is from the Ad Planner profile for a site about politics. Although the site is not about pets, it scores a high (36.9x) affinity with audiences who are interested in pets, which means visitors to this site are 36.9 times more likely to be interested in pets than the average Internet population. A category filter on pets would never locate this site, but an interests search on pets would. Audience interests gives advertisers a new tool for selecting the best sites for their media plans. To learn more about how we generate the data for audience interests, please refer to our methodology document. To try out the new audience interests features, visit www.google.com/adplanner. Advertisers can now build media plans to reach audiences with interests relevant to their campaigns using DoubleClick Ad Planner. Audience interests represent the aggregate interests of visitors to any given website. With today’s release, the top ten audience interests for each site are now listed on the profile page for each of the millions of sites profiled in Ad Planner. This provides an important complement to the demographic data that’s already widely available. By combining an understanding of a website’s demographic appeal with the range of interests of the audience the site attracts, advertisers can get a more complete picture of who they will reach by advertising on the site. As part of the MRC audit, we're sharing more details about our data sources and methodology. For our traffic measurement, Ad Planner uses a hybrid measurement methodology that combines direct-measured site traffic, through Google Analytics data that publishers have chosen to opt in to provide us, and sample aggregated data from Google products and services. We currently have over 10,000 sites that are contributing direct measured opt-in data to Ad Planner. Our sample data comes from a variety of sources including anonymized, aggregated Google Toolbar data from users who have opted in to enhanced features, opt-in anonymous Google Analytics data, opt-in external consumer panel data, and other third-party market research. All of this data is aggregated over millions of users and is powered by computer algorithms. The breadth and reliability of this aggregated data means that our traffic measurements are among the most accurate in the industry. To learn more about Ad Planner's data, we invite you to read our recently updated methodology document. To start using Ad Planner, visit us at www.google.com/adplanner. To further our commitment to provide reliable data in DoubleClick Ad Planner, we have submitted it for accreditation by the Media Rating Council (MRC). The MRC is an advertising industry group that works to accredit audience measurement services that are valid, reliable, and effective. MRC accreditation is voluntary and some third-party measurement products have submitted for accreditation, as we have; some have not. Once complete, the MRC accreditation will provide independent confirmation that Ad Planner's methodologies, and the processes supporting this technology, adhere to industry standards.